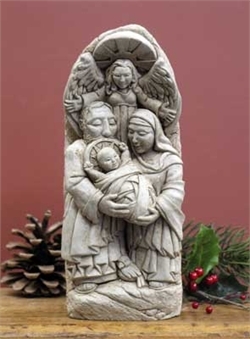 Home > Nativities Sets > USA Nativities > Angel Watching Over Nativity Aged Hand Cast Stone Made in U.S.A. This is one of my favorite nativity scenes. I love the angel hovering above and the dove at their feet. It just has a different feeling from most other nativity scenes. It can stand on a side table or hang near an entry. The Aged Stone Patina on this nativity is on a natural stone base to replicate soft brown earth tones. Since the color is artistically applied by hand, no two pieces are exactly alike.